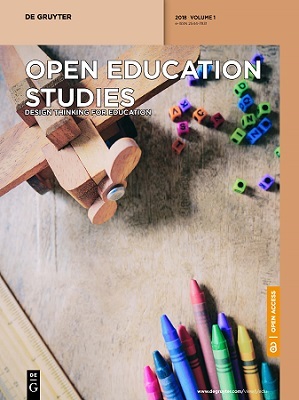 Open Education Studies is a new open access journal by De Gruyter, with Theo Bastiaens as the editor in chief. The 2019 topical issue is focused on ‘Design Thinking for Education’. Design thinking is a problem solving method geared to overcome wicked problems, that have no right or wrong solution and resist traditional scientific and engineering approaches, as “the information needed to understand the problem depends upon one’s idea for solving it” (Rittel & Webber, 1973, 161). Design thinking aims at transcending the immediate boundaries of the problem to ensure that the right questions are being addressed. The process foresees steps that allow participants to analyze, synthesize, diverge and generate insights from different domains through drawing, prototyping and storytelling (Brown, 2009). During the design thinking process, the facilitator encourages learners to see constraints as inspiration (Brown & Wyatt, 2010). The results are typically not directed toward a technological “quick fix” but toward new integrations of signs, things, actions, and environments (Buchanan, 1992). While the concept of design thinking within the academic dialogue of design has been under discussion for more than 30 years, its recent adoption as an innovation method has lead to its popularity in various disciplines (Wigley and Straker, 2017). As Goldschmidt (2017) stated, the term design thinking means different things to different communities. The author distinguishes two facets: (1) Descriptive models of the design process, based on observational research of real-life or laboratory design activities by individuals or teams; (2) a method to be practiced in industries that strive to introduce innovative products or services. Interest in how designers work and think progressively moved from the purview of designers and architects to the field of management and business administration (Elsbach & Stigliani, 2018). Both communities emphasize iterative processes, collaboration, speed of concept modeling and testing through prototyping, and interaction with users. As awareness of the designed experience increases, so does the desire to apply the process of design thinking to a wider range of scenarios to analyze and resolve any business or productivity challenge in a new, insightful, invigorating manner (Hodgkinson, 2013). The essence of design thinking in education is to put learners into contexts that make them think and work like an expert designer, and thereby foster civic literacy, empathy, cultural awareness and risk taking (Sharples et al., 2016). This special issue seeks contributions that exemplify the adoption of design thinking and related approaches (e.g., LEGO serious play, participatory design and bricolage) in education. Of particular interest are case studies that analyze both the process and the outcomes of design thinking, while critically reflecting upon its effectiveness. Quantitative and qualitative methodological approaches (e.g., ethnography, surveys, mixed methods, in vivo experiments) are equally welcome. This special issue will only publish original research papers (8,000-10,000 words). Papers submitted must not have been published previously or under consideration for publication, though they may represent significant extensions of prior work. All submitted papers will go through a rigorous single-blind peer-review process (with at least two reviewers). An abstract submission is mandatory to allow editors a better assignment of reviewers. For this reason, authors which intent to submit a paper to this special issue should submit a proposal with title and extended abstract (1-3 pages, including references) to the issue’s coordinating editor via https://designthinking.web.unc.edu/abstracts/. Before completing their manuscript, authors should carefully read over the journal’s Author Guidelines, which are located at https://www.degruyter.com/view/supplement/s25447831_Instruction_for_Authors.pdf. Prospective authors should submit an electronic copy of their complete manuscript using the journal’s submission system: http://www.editorialmanager.com/openedu/. Planned publication: July 2019 (articles will be published upon being accepted on an ongoing basis). Brown, T. (2009). Change by Design: How Design Thinking Transforms Organizations and Inspires Innovation. New York: HarperCollins Publishers. Elsbach, K. D., & Stigliani, I. (2018). Design Thinking and Organizational Culture: A Review and Framework for Future Research. Journal of Management, 0149206317744252. Goldschmidt, G. (2017). Design Thinking: A Method or a Gateway into Design Cognition?. She Ji: The Journal of Design, Economics, and Innovation, 3(2), 107-112. Hodgkinson, G. (2013). Teaching Design Thinking. In J. Herrington, A. Couros & V. Irvine (Eds. ), Proceedings of EdMedia 2013–World Conference on Educational Media and Technology (pp. 1520-1524). Victoria, Canada: Association for the Advancement of Computing in Education (AACE). Wrigley, C., & Straker, K. (2017). Design thinking pedagogy: The educational design ladder. Innovations in Education and Teaching International, 54(4), 374-385.